A Texas native, Richard has called Southern California home for over 10 years. An avid animal lover and an outdoor enthusiast, Richard enjoys finding his feet at the local beaches and hiking trails. He's not yet a dog dad, but the plans are definitely in the works! Richard has a diverse business background which lends him 15 years of sales, marketing, and operations experience. Understanding that people are the core of Richard's business combined with his professionalism, perseverance, and humility leave him poised to be your advocate. Richard has a "roll up your sleeves" and make things happen work ethic, dedication to details, and commitment to integrity. Richard has always had a passion for real estate. 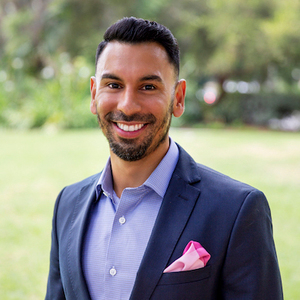 His hard work and patience have positioned him to realize his dream of going "all in" to real estate, and with the encouragement of family and friends, Richard is grateful to be one of the newest members of the Compass family as part of the Sebastian Wolski Team.